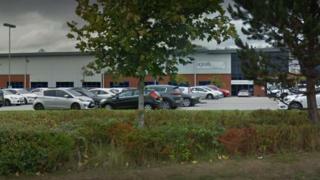 The call centre in Trentham Lakes is to close, as part of Ageas's reorganisation of its six sites in England. Staff were informed on Monday the branch would close in June 2020. Ageas said the decision was down to a reduction in customers wanting to buy insurance over the phone. Andy Watson, chief executive officer, described the situation as a "difficult and an unsettling time" for employees. He said: "It's with regret that we have decided to close our Stoke office and we know our employees will be disappointed with this news. "We will do all we can to support our people in securing alternative roles and are working with a number of organisations including local businesses." The firm added increased business efficiency created by investing in technology played a part in the decision.